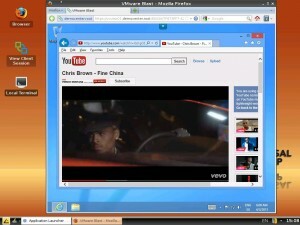 today i’ve tested the IGEL Linux together with VMWare’s Horizon View 5.2. One new Feature coming with Horizon View 5.2 is the Horizon View HTML Access based connection (aka VMWare Blast). To use this feature you need to install an add-on component to your View Connection Server and also an extra Agent to the VM. In my Demo Setup i’ve used a Windows 8 based Desktop running on a VMWare Server to have PCOIP (thru Software) available, i’ve also installed the VMWare Tools, VMWare View Agent and the new Horizon View 5.2 Remote Experience Agent (HTML/VMWare Blast). For my tests i’ve used a trial license but it should not make any difference regarding the results. So it worked fine with the current IGEL Linux Version 4.11.100 but do not aspect a high multimedia performance at all, this is not related to the IGEL Linux! I’ve tested it also with my I7 Laptop and also here the results for multimedia content are not the best too, this is a similar result like for Web based Clients from other vendors. For my next test i’ve used the native VMWare Client coming with the 4.11.100 Firmware, this is the Version 1.6.0 but Horizon View 5.2 comes with a new client version 1.7.0. I’ve not noticed any disadvantage related to this but it could be that some new features are not working or maybe some issues are fixed with the 1.7 Version from VMWare. I hope that IGEL has included the new 1.7.0 Client in the upcoming 4.12.100 Firmwares. 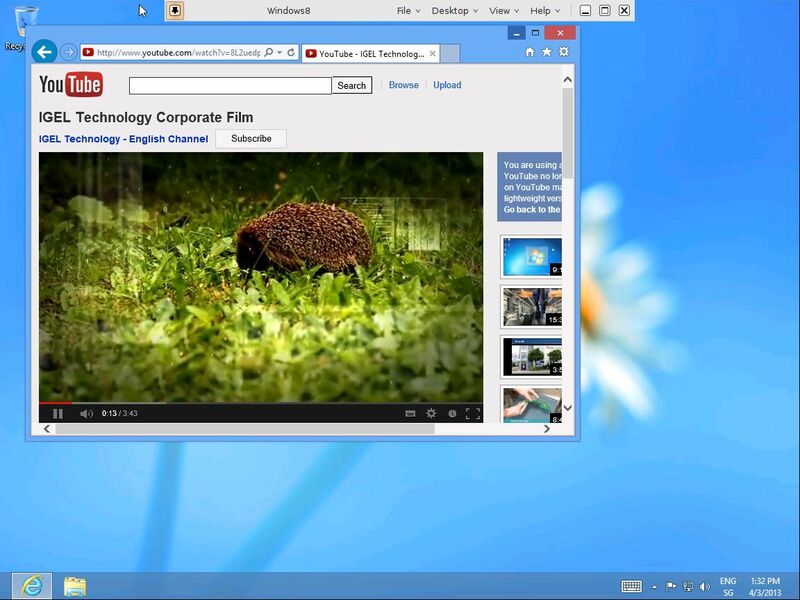 After i’ve configured the IGEL Client thru the local setup i was able to start a connection without any issues, also i was able to connect thru PCOIP to my Windows 8 based virtual Horizon View 5.2 desktop. The multimedia results are looking much better compared to the VMWare Blast (HTML Access) connection but this was what i assumed when starting the test. I was also able to connect my USB devices to the VM and for me it worked without any issue; of course i did not test it 24/7 or all possible device types. In general it looks that VMWare Horizon View 5.2 works good together with the IGEL Linux based Thin Clients, maybe the results will be better with the new Client 1.7.0 but here IGEL has to deliver it thru a Firmware update. Update: I got the confirmation that the upcoming 4.12.100 will also contain the new VMWare Client for Horizon View. The firmware should be available in the upcoming weeks. This entry was posted on Wednesday, April 3rd, 2013 at 15:44 and is filed under General, View. You can follow any responses to this entry through the RSS 2.0 feed. You can leave a response, or trackback from your own site.